Four full pulls (eight strokes) of Rounds on Six. The ringers ring in sequence, from lightest bell to heaviest bell. When rung as an exercise, we ring Rounds anywhere from a few minutes to half an hour or more, giving the ringers a chance to adjust their striking so that the rounds sound evenly, and plenty of opportunity to settle into a good clean motion so it can become a habit. We also sometimes ring Rounds for service ringing, if that’s what that day’s band rings best. The ringers continue until the conductor calls “Stand” (at the beginning of a handstroke), after which the ringers stand their bells at the next handstroke. We generally ring rounds on four to all eight bells, depending on how many ringers are available. 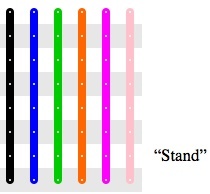 If we have N ringers and N is less than the number of bells (we have eight), the conductor may place the ringers on “the light N” (1 through N), for example “the light four”, which requires exact control on every stroke, or “the heavy N” (m through N+m), for which it is more necessary to keep a consistent, efficient motion attuned to the bell’s natural motion. We find this a very effective exercise that pushes ringers to relax, listen to their bell, and even out their striking. Every so often, the conductor calls the band to stand, and everyone moves to the next lightest bell, which for us is to the right. The ringer who had been on the lightest bell in use rotating around to take the just-vacated heaviest bell. We rotate in this direction because it is easier to move from the treble to the tenor, for which that ringer will now have to use more effort, than from the tenor to the treble, which the ringer is likely to bang against its stay from being used to pulling vigorously enough to control the tenor. One full pull (handstroke then backstroke) then stand. The ringers tend to concentrate their conscious effort on being able to set the bell after the single pull—no one wants to be left trying to set after everyone else has already done so and is watching!—leaving their less-conscious mind to focus on making their striking clean and accurate. After a few of these, our band’s striking on Rounds is often much improved. It is also a good way to give the band a feeling of accomplishment, if they are able to all stand their bells after the single pull. 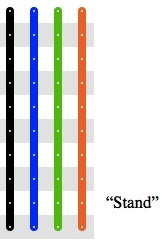 The conductor does not call “Stand” because it would have to be called before the first handstroke. Whether the one stroke is a handstroke or backstroke depends on whether the bells had been stood at hand or at back. This requires everyone in the band to set their bell at backstroke, and to pull off at backstroke. If they can do so, it gives everyone an even stronger sense of accomplishment and a glorious feeling that they can take on anything. This gives the band three chance to exhibit good striking. Whether the three strokes are handstroke-backstroke-handstroke or backstroke-handstroke-backstroke depends on whether the bells had been stood at hand or at back.